Almost four years ago a handful of people gathered in Airbus sales chief John Leahy's spacious country house outside Toulouse and argued long into the evening over curry and cigars. Last weekend they met up again at a Parisian hotel for more haggling, with breaks taken at a nearby cafe where the informality of old business friendships mingled with hard-nosed negotiations typical of the aircraft industry. The sum total of money discussed over these meals? About $40 billion at catalogue prices, and the bill was for 430 jets, all sold to the same Indian airline -- IndiGo, the low-cost carrier which has grown to become the country's biggest airline in eight years of operating. Represented according to insiders by co-founder Rakesh Gangwal and President Aditya Ghosh, IndiGo has now made aircraft industry history twice in four years -- each time by placing record orders for Airbus planes, including last Wednesday's announcement that it will buy 250 A320neo jets. The largest order in India's aviation history is IndiGo's most aggressive bet yet that Indian air travel is on the cusp of a huge expansion, and that the model that made it the nation's only profitable carrier will keep working as competition intensifies. "IndiGo is showing us the level of confidence it has in its own sustainability, in the long-term growth of aviation and in the future performance of the Indian economy," said Harsh Vardhan, chairman at Delhi-based Starair Consulting. Airline industry executives are hoping India's weak economy will rebound under new Prime Minister Narendra Modi and that the government will press for cuts to jet fuel tax and build more airports, slashing costs and opening up new markets. Higher disposable incomes, an expanding middle class and rapid urbanisation have made India one of the world's fastest-growing domestic aviation markets, where passenger numbers are expected to grow by more than 75 percent in the next six years to exceed 217 million. According to Airbus executive vice-president and the president of its India operations Kiran Rao, optimism about growth in Indian aircraft demand is rising. But few airlines have translated that optimism into new orders on the scale of IndiGo's since most are losing money. "People are too focused on India’s negatives. IndiGo is aware of the challenges and it is adept at steering itself around them. That is how it became India's largest carrier," said one source familiar with the airline's thinking. "There is, however, a great deal of optimism about the future within the airline and that comes right from the top." Ghosh told Reuters last week India was a "highly underpenetrated market" and that a lot of the new planes would be for growth rather than replacing older aircraft. Despite more Indians flying, fierce competition and high costs have left airlines including SpiceJet, Jet Airways and state-run Air India losing cash fast. The sector will lose up to $1.4 billion more this financial year, according to consultancy CAPA. Privately held, IndiGo does not disclose its full accounts but is the only major Indian carrier which says it is profitable. It reported a sixfold rise in net profit to 7.87 billion rupees ($128 million) in the 2012-13 financial year, and has since expanded its market share to about 32 percent. Founded in 2006 by travel entrepreneur Rahul Bhatia and Gangwal, a former chief executive of US Airways and an old hand in executing game-changing aircraft orders, IndiGo has relied almost entirely on the sale and leaseback model to fuel its growth. IndiGo buys a single line of planes in bulk at discounts, and then sells them to leasing companies around the time they are delivered, leasing the planes back and retiring the aircraft within six years to avoid depreciation and maintenance costs. This keeps capital costs low and its balance sheet light, and is a strategy some analysts say hands it up-front cash to meet operating costs and tips it into profitability as rivals succumb to losses. "IndiGo is also a good customer and in a good cashflow position, which means that there is little chance of default. In India IndiGo is probably the best customer for lessors," said one person familiar with the leasing negotiations. 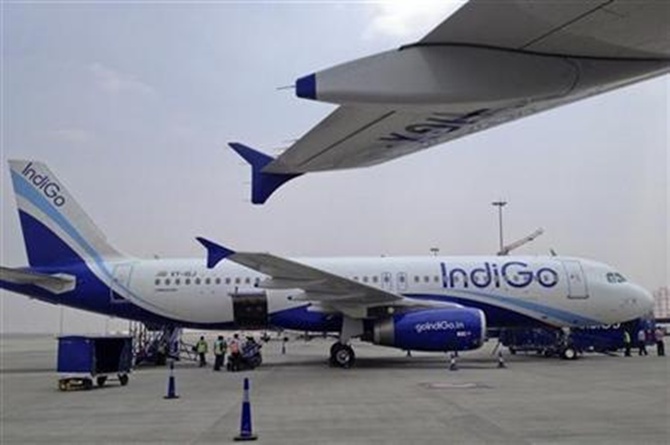 IndiGo denies that the sale and leaseback model is the reason it makes money, and instead points to an advertising budget which is less than 1 percent of revenues, the fast turnaround of its fleet and its high level of seat sales as a proportion of capacity compared with its rivals. The airline says it will also stick to the standard low-cost operator's strategy of flying a single type of narrowbody plane within India and to a handful of overseas destinations. IndiGo's ascent is not without its risks, however. An end to the era of cheap borrowing to finance its plane orders would raise its costs, and should India's fragile economic recovery wilt IndiGo would be left facing delivery of 250 Airbus planes from 2018 that it would struggle to fill. Increased competition in a notoriously cut-throat Indian market plagued by overcapacity could throw up the biggest hurdle to IndiGo's ambitions, analysts say. Once-profitable airlines like Jet, which went from market leader in the 1990s to today's sprawling international carrier, have turned loss-making in the last two years as fares fell faster than they could cut costs. Meanwhile Malaysia-based budget carrier AirAsia launched its first Indian flight in June, bringing in an airline which manages to operate with one of the lowest unit costs per kilometre flown in the industry. AirAsia India did not respond to requests for comment on IndiGo. "The biggest risk for IndiGo is how the competition behaves, whether AirAsia and others respond more aggressively now," said Starair's Vardhan.